FTSE Russell plans to upgrade Poland to Developed Market status by September 2018, making it the first Central and Eastern European country to be awarded Developed Market status. This will place Poland along with 24 developed nations ranked by FTSE, and stocks from the country would get included in the FTSE Developed All Cap Ex-US index. The largest investment banks and equity funds use FTSE Russell’s indices to mimic their portfolios. Poland will constitute 0.38% of the FTSE Developed All Cap Ex-US, lower than its 1.6% composition of the FTSE Emerging All Cap index. As a consequence, JPMorgan expects outflows of $340 million from the country’s stock markets. Marek Dietl, president of the Warsaw Stock Exchange (WSE) believes this development is a big step and will encourage economic development and capital flows in the country. Countries that get included in MSCI indices usually attract fund flows. There are passive funds that track these inclusions to keep tabs on overall market sentiment. 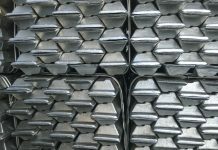 Index weighting and composition is an important metric for investors as fund managers and foreign investors try to mimic the index when allocating their funds and building their portfolios. Countries that are included in the MSCI Index generally see higher allocation from foreign investors. The addition of stocks to major indices also increase their overall trading volumes and thereby their returns. Conversely, removal can lead to outflows from the country’s stock’s markets. In Poland’s case, experts currently expect outflows in the near-term as global portfolio managers will realign their portfolios after the upgrade. Foreign investors seeking exposure in Poland could invest in country-focused ETFs that offer diversification through investment in a single US security. Alternatively, investors wanting direct exposure could consider ADRs of Polish companies. The most popular ETFs for U.S. investors are the iShares MSCI Poland Capped ETF (EPOL) and the VanEck Vectors Poland ETF (PLND). 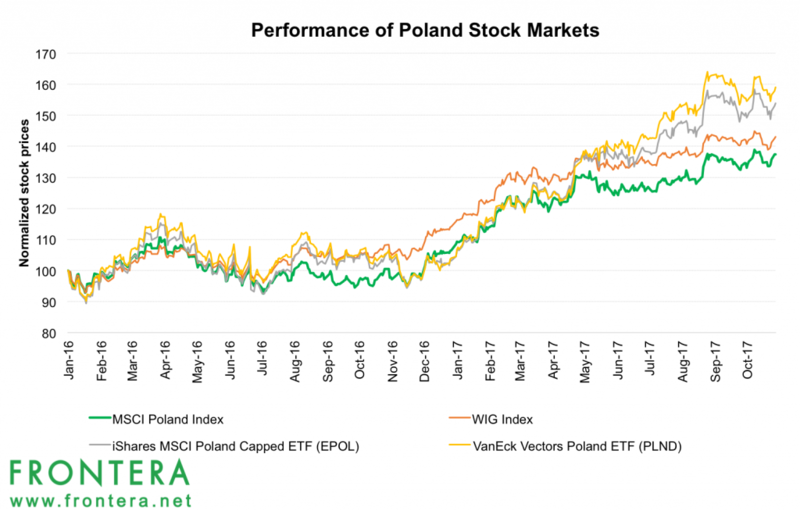 The VanEck Vectors Poland ETF (PLND) invests 91% of its portfolio in Polish Equity while the iShares MSCI Poland Capped ETF provides 100% exposure to Poland. With assets under management of $356 million, the EPOL ETF offers concentrated exposure to polish companies. Financials are the top sector with 43% of assets, followed by energy, consumer cyclicals, and utilities. The funds top ten holdings constitute ~60% of its assets. 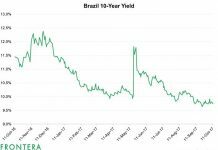 The fund is up 49% over the last one-year period, and year-to-date in 2017 it has gained 47%. The PLND ETF invests in a portfolio of companies that generate at least 50% of revenues from Poland. Financials are the top sector with 39% of assets, followed by energy, consumer cyclicals, and utilities. With assets under management of only $21 million, this fund has been unable to garner significant interest from the investor community. 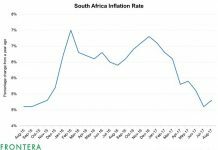 However, the fund is up 53% over the last one-year period, and year to date in 2017 it has gained 50%. Year-to-date, the MSCI Poland Index has surged 15.83% while the Polish benchmark WIG20 index has gained 29%. 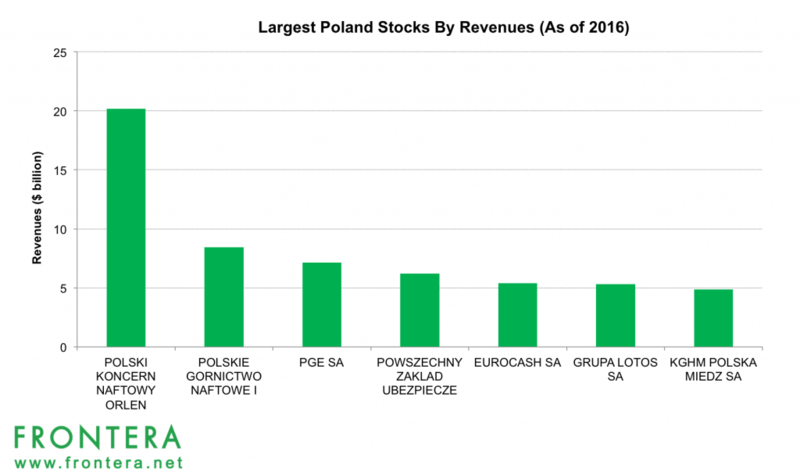 The largest Polish stocks by market capitalisation are Polski Koncern Naftowy Orlen, Pko Bank Polski Sa, Powszechny Zaklad Ubezpiecze, Polskie Gornictwo Naftowe I, Bank Zachodni Wbk. Currently, these stocks have market caps of $14.9 billion, $12.4 billion and $10.5 billion, $10.5 billion, and $9.7 billion respectively. Year to date, shares of these companies have returned 20.5%, 7.7% and -12.8% respectively. PKN Orlen is a Poland based oil refiner and petrol retailer with largest operations across Poland, Czech Republic, Germany, and the Baltic States. Orlen is the largest fuel retailer in Poland with 2,000 outlets and has made significant investment abroad. The company has a majority stake in Czech based refiner Unipetrol. Orlen also owns ~85% of the only oil refinery in the Baltic States – ORLEN Lietuva – that it took over in 2006 from Yukos. PKN Orlen, under a joint venture with the Netherlands firm Basell, also owns Poland’s largest plastics company. In 2005, PKN Orlen was involved in a proposed merger with Hungarian oil major MOL Group that would have resulted in the combined companies becoming the largest in Central Europe. However, the planned merger failed. PKN Orlen is the largest Polish company by revenues with annual sales of $20.2 billion in 2016. The company trades on the Polish, Berlin and Frankfurt stock exchanges with tickers PKN.WSE, PKY1.BE and PKY1.F. With a market value of over $14.9 billion the company is currently the most valuable company in Poland. PKO Bank is Poland’s largest bank with assets of nearly $78 billion in 2016. PKO Bank is one of the best-recognised and most valuable brands in Poland. The bank’s primary area of expertise is retail banking. It services both retail and corporate clients. The bank also has a presence in Ukraine through its stake in Kredobank. The Polish state government still holds a 51.2% stake in the bank through various state-owned companies, despite the bank going public on the Warsaw Stock Exchange in May 2011. In 2016, PKO Bank reported net interest income of nearly $2.1 billion and ranked 900 on the Forbes Global 2000 companies. The company trades on the Polish, Berlin and Frankfurt stock exchanges with tickers PKO.WSE, P9O.BE and P9O.F. Powszechny Zakład Ubezpieczeń, or PZU Group is one of the largest financial institutions in Poland and is one of the biggest insurance providers and Eastern and Central Europe. PZU Group offers the largest selection of insurance products in Poland in the areas of non-life insurance, personal and life insurance, investments funds and open pension fund. PZU provides comprehensive insurance coverage in all key sectors of private, public and economic activity. The PZU Group also manages an open pension fund, investment funds and savings programmes. In 2016, the company generated revenues of $6.2 billion, gross written premiums of $2.9 billion and net profits of $436 million. The company trades on the Polish, Berlin and Frankfurt stock exchanges with tickers PZU.WSE, 7PZ.BE and 7PZ.F.